Left to right: Zach Kowa, director of post press operations; Joseph R. Morelli, vice president of sales and marketing; and Tonya S. Kowa-Morelli, president; chose a new Koenig & Bauer Rapida 164 64-inch eight-color press with coating to support the firm’s explosive demand and growth. Left to right: Zach Kowa, director of postpress operations; Joseph R. Morelli, VP of sales and marketing; and Tonya S. Kowa-Morelli, president; chose a new Koenig & Bauer Rapida 164 64˝, eight-color press with coating to support the firm’s explosive demand and growth. DALLAS - April 5, 2018 - When Tonya Kowa-Morelli took over the reigns at Huston Patterson, her family’s privately owned package printing business in August 2013, the industry as a whole was still rebounding from economic and digital challenges. But in those past four years, she has re-shaped and re-invigorated the company to compete effectively and efficiently posting double-digit sales and demonstrating that the next generation within the family has the leadership chops to continue its fast-paced growth. Kowa-Morelli, the third generation to operate the business, was named president of the firm after serving in various sales, marketing and leadership roles for nine years. In her first year as president, her sales team notched a 30% increase while reducing spoilage and seeing increased efficiency in the pressroom. 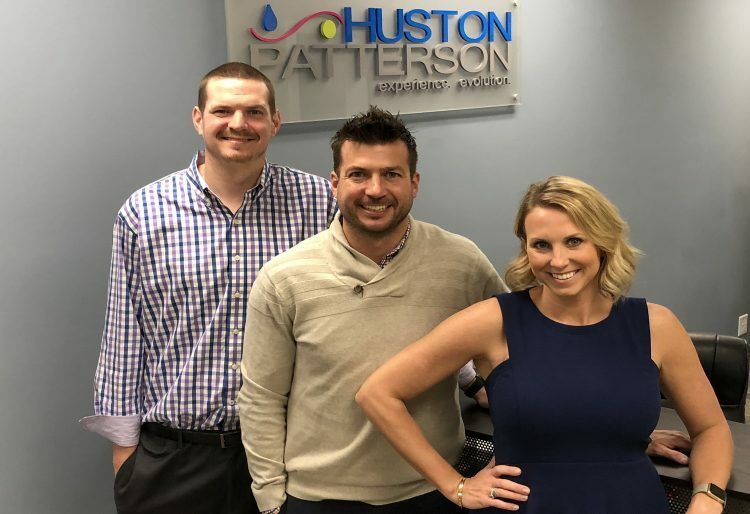 Under her guidance both Illinois facilities - Huston Patterson in Decatur and Sigma Graphics in Ottawa - continue to add the latest technology to benefit their clients. This month under her watchful eyes, Kowa-Morelli signed a contract for a new Koenig & Bauer Rapida 164 64˝, eight-color press with coating to be installed later this year at its 110,000-sq.-ft. Decatur facility. After careful consideration, the new press was chosen to provide additional capacity for the extraordinary increase in sales, boost its capabilities especially for the growing specialty coating market, and further its fast-turnaround and flexibility for the large format package printing industry it serves. The new press will be installed alongside the firm’s existing Koenig & Bauer 64˝, seven-color with UV; 64˝, six-color; and 56˝, six-color; as well as the Rapida 105 40˝, seven-color UV press at Sigma Graphics. For added flexibility and speed, Huston Patterson specified the new Rapida 164 with UV and sidelay-free infeed DriveTronic SIS technology. The latter automatically aligns every single sheet calmly and effortlessly. With an additional press having UV capability, Huston Patterson can provide quicker turn times with fast instant cure UV drying as well as the flexibility to utilize those specialty value-added coatings, such as strike through, spot, soft touch, and gloss. An important capability for Huston Patterson is its ability to match its client’s specific brand colors on its printed jobs. The firm is proud to have achieved G7 Master Printer status in utilizing its technology from proof to press. Its clients benefit in cost savings, efficiency, and the reliability and quality in the best color management methods. The new Koenig & Bauer Rapida 164 is equipped with QualiTronic ColorControl, a popular technology that utilizes a camera system installed after the last printing or coating unit. The system permits automatic measurements of optical density in the freshly printed color bars. These measurement values serve as a basis for fast dynamic inline control of the ink key settings. He continues, “We cherish the genuine partnership and trust that we’ve created together over so many years with Huston Patterson. We are certain that this new KBA press will help to efficiently move more projects through production, fuel future growth, and continue Huston Patterson's legacy of the highest quality printing and on-time service organization for many years to come."